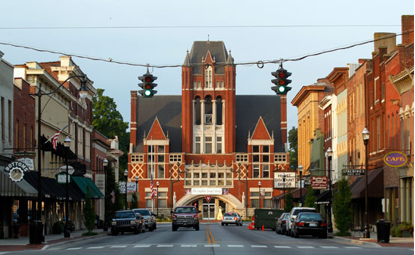 Where to find us: You can find our beautiful, 155 year old church on the corner of Flaget Avenue and 2nd Street in downtown Bardstown (recently named the “Most Beautiful Small Town in America!”). It is a wonderful town filled with history and tradition and that classic Norman Rockwell look! Our church is rather “land locked,” but we have a lot of off-street parking in the city parking lot across the street and on Sunday Mornings in the bank parking lot right next door and the parking lot behind the church. Some history: Our present church building was completed in 1856 and the Annual Conference met in the building with Bishop James Andrews presiding in 1859. In 1995 the congregation built a new addition to provide for more Sunday School classrooms, church offices, a large kitchen and the Family Life Center. On May 24th 1998 the church endured a lightning strike in the bell tower causing fire to break out and burn undetected for some time. The water and smoke damage was quite extensive and the original sanctuary was gutted. After many months of planning and reconstruction the congregation celebrated its first service in the newly rebuilt sanctuary on October 24th 1998. The bell, originally struck by lightning, stands outside the church as a constant reminder of the dedication and perseverance of the church to continue God’s work! In 2004 the church developed the 10 acre Second Campus, located 5 miles north of downtown Bardstown, with an open-air chapel and numerous recreation areas as a way of extending and strengthening God’s voice in the Bardstown community. Today: Our facilities are busy much of the week with committee meetings, youth group, Wednesday night dinners, music rehearsals, Scout troops and small group meetings. Our sanctuary, with its vaulted ceiling and beautiful stained glass windows is both a quiet refuge where you can pray and a popular venue for concerts and weddings. We provide attentive childcare by qualified caregivers during all Sunday morning services and for some other activities during the week.